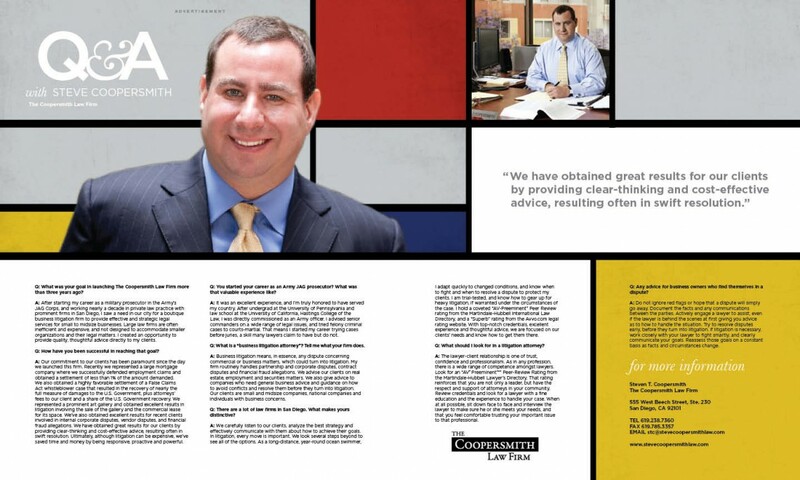 Q: What was your goal in launching The Coopersmith Law Firm more than three years ago? A: After starting my career as a military prosecutor in the Army’s JAG Corps, and working nearly a decade in private law practice with prominent firms in San Diego, I saw a need in our city for a boutique business litigation fi rm to provide effective and strategic legal services for small to midsize businesses. Large law firms are often inefficient and expensive, and not designed to accommodate smaller organizations and their legal matters. I created an opportunity to provide quality, thoughtful advice directly to my clients. Q: How have you been successful in reaching that goal? A: Our commitment to our clients has been paramount since the day we launched this fi rm. Recently we represented a large mortgage company where we successfully defended employment claims and obtained a settlement of less than 1% of the amount demanded. We also obtained a highly favorable settlement of a False Claims Act whistleblower case that resulted in the recovery of nearly the full measure of damages to the U.S. Government, plus attorneys’ fees to our client and a share of the U.S. Government recovery. We represented a prominent art gallery and obtained excellent results in litigation involving the sale of the gallery and the commercial lease for its space. We’ve also obtained excellent results for recent clients involved in internal corporate disputes, vendor disputes, and financial fraud allegations. We have obtained great results for our clients by providing clear-thinking and cost-effective advice, resulting often in swift resolution. Ultimately, although litigation can be expensive, we’ve saved time and money by being responsive, proactive and powerful. Q: You started your career as an Army JAG prosecutor? What was that valuable experience like? A: It was an excellent experience, and I’m truly honored to have served my country. After undergrad at the University of Pennsylvania and law school at the University of California, Hastings College of the Law, I was directly commissioned as an Army officer. I advised senior commanders on a wide range of legal issues, and tried felony criminal cases to courts-martial. That means I started my career trying cases before juries, a skill many lawyers claim to have but do not. Q: What is a “business litigation attorney”? Tell me what your firm does. fi rm routinely handles partnership and corporate disputes, contract disputes and financial fraud allegations. We advise our clients on real estate, employment and securities matters. We also give advice to companies who need general business advice and guidance on how to avoid conflicts and resolve them before they turn into litigation. Our clients are small and midsize companies, national companies and individuals with business concerns. Q: There are a lot of law firms in San Diego. What makes yours distinctive? A: We carefully listen to our clients, analyze the best strategy and effectively communicate with them about how to achieve their goals. In litigation, every move is important. We look several steps beyond to see all of the options. As a long-distance, year-round ocean swimmer, I adapt quickly to changed conditions, and know when to fight and when to resolve a dispute to protect my clients. I am trial-tested, and know how to gear up for heavy litigation, if warranted under the circumstances of the case. I hold a coveted “AV-Preeminent” Peer Review rating from the Martindale-Hubbell International Law Directory, and a “Superb” rating from the Avvo.com legal rating website. With top-notch credentials, excellent experience and thoughtful advice, we are focused on our clients’ needs and know how to get them there. Q: What should I look for in a litigation attorney? reinforces that you are not only a leader, but have the respect and support of attorneys in your community. Review credentials and look for a lawyer with a fine education and the experience to handle your case. When at all possible, sit down face to face and interview the lawyer to make sure he or she meets your needs, and that you feel comfortable trusting your important issue to that professional. Q: Any advice for business owners who find themselves in a dispute? A: Do not ignore red flags or hope that a dispute will simply go away. Document the facts and any communications between the parties. Actively engage a lawyer to assist, even if the lawyer is behind the scenes at first giving you advice as to how to handle the situation. Try to resolve disputes early, before they turn into litigation. If litigation is necessary, work closely with your lawyer to fight smartly, and clearly communicate your goals. Reassess those goals on a constant basis as facts and circumstances change.